AT LAST the electrical dry shave is with us! 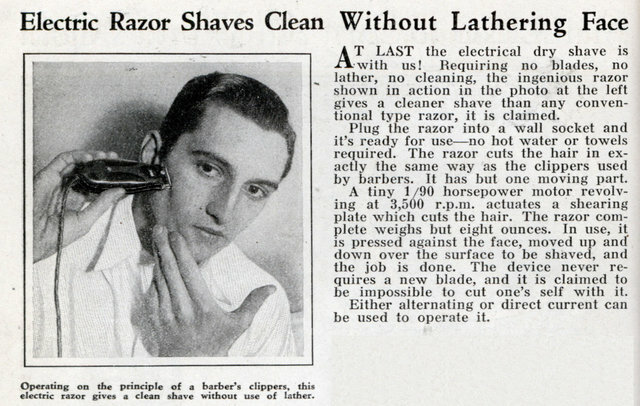 Requiring no blades, no lather, no cleaning, the ingenious razor shown in action in the photo at the left gives a cleaner shave than any conventional type razor, it is claimed. Plug the razor into a wall socket and it’s ready for useâ€”no hot water or towels required. The razor cuts the hair in exactly the same way as the clippers used by barbers. It has but one moving part. A tiny 1/90 horsepower motor revolving at 3,500 r.p.m. actuates a shearing plate which cuts the hair. The razor complete weighs but eight ounces. In use, it is pressed against the face, moved up and down over the surface to be shaved, and the job is done. The device never requires a new blade, and it is claimed to be impossible to cut one’s self with it. Either alternating or direct current can be used to operate it.